There are so many parks and attractions in the Florida panhandle, how do you know which ones your family will enjoy most? All kids like animals, so we decided to tell you all about the best animal adventures in Panama City Beach. Are you looking for an intimate animal adventure with you and your family only? You have to look into the Shell Island dolphin tours. These tours are operated by the Shell Island Shuttle company at Saint Andrews State Park. 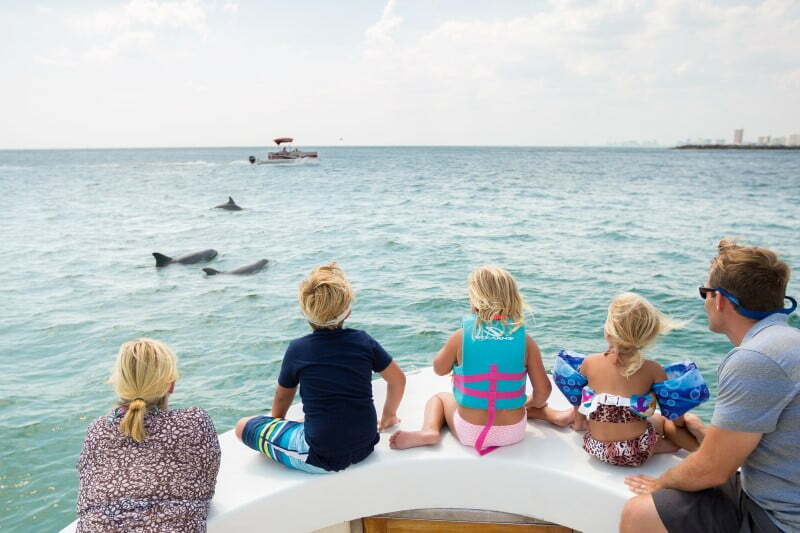 Local captains will take you and your family to all of the best spots for viewing and interacting with the dolphins. As part of the tour you are also given snorkeling gear to use for the day while you are swimming with the dolphins. You will be able to see them playing, communicating with each other and looking for their next meal. This is truly a memorable experience that you and your family will remember for a long time. Maybe you are looking for something a little more furry? Try the sloth experience at Zoo World. The sloth encounter is one of the most popular features of the zoo. Guests are allotted time in the enclosure with these beautiful creatures. Children are particularly fond of this as the sloths move in a slow and calm manner which puts kids at ease. Your children will always remember their day at Zoo World with their new sloth friends! Can you hang out with penguins at the beach? You can if you take a trip to Gulf World in the heart of Panama City Beach. Gulf World has an African black footed penguin encounter. Guests Get up close and personal with an African Black-Footed Penguin in Gulf World’s new interactive habitat. Guests will be immersed into the African penguin salt water habitat where they will get to interact and learn about the Endangered African penguin from animal care specialists. This is a must see during your next family vacation. PCB has so much to offer when it comes to memorable experiences for your family or groups. These animal encounters are just a small sample and we hope you don’t stop with just these three suggestions!